Each application that requires the administrator access token must prompt the administrator for consent. The one exception is the relationship that exists between parent and child processes. Child processes inherit the user access token from the parent process. Both the parent and child processes, however, must have the same integrity level. Windows Server 2012 protects processes by marking their integrity levels. Integrity levels are measurements of trust. A "high" integrity application is one that performs tasks that modify system data, such as a disk partitioning application, while a "low" integrity application is one that performs tasks that could potentially compromise the operating system, such as a Web browser. Applications with lower integrity levels cannot modify data in applications with higher integrity levels. When a standard user attempts to run an application that requires an administrator access token, UAC requires that the user provide valid administrator credentials. In order to better understand how this process happens it is important to review the details of the Windows Server 2012 logon process. The following illustration demonstrates how the logon process for an administrator differs from the logon process for a standard user. 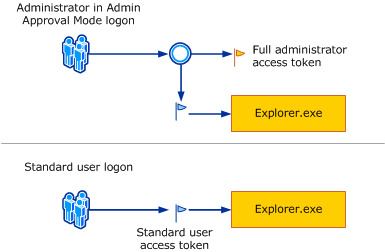 When an administrator logs on, two separate access tokens are created for the user: a standard user access token and an administrator access token. The standard user access token contains the same user-specific information as the administrator access token, but the administrative Windows privileges and SIDs are removed. The standard user access token is used to start applications that do not perform administrative tasks (standard user applications). The standard user access token is then used to display the desktop (Explorer.exe). Explorer.exe is the parent process from which all other user-initiated processes inherit their access token. As a result, all applications run as a standard user unless a user provides consent or credentials to approve an application to use a full administrative access token. A user that is a member of the Administrators group can log on, browse the Web, and read e-mail while using a standard user access token. When the administrator needs to perform a task that requires the administrator access token, Windows Server 2012 automatically prompts the user for approval. This prompt is called an elevation prompt, and its behavior can be configured by using the Local Security Policy snap-in (Secpol.msc) or Group Policy. The term "elevate" is used to refer to the process in Windows Server 2012 that prompts the user for consent or credentials to use a full administrator access token. When UAC is enabled, the user experience for standard users is different from that of administrators in Admin Approval Mode. The recommended and more secure method of running Windows Server 2012 is to make your primary user account a standard user account. Running as a standard user helps to maximize security for a managed environment. With the built-in UAC elevation component, standard users can easily perform an administrative task by entering valid credentials for a local administrator account. The default, built-in UAC elevation component for standard users is the credential prompt. The alternative to running as a standard user is to run as an administrator in Admin Approval Mode. With the built-in UAC elevation component, members of the local Administrators group can easily perform an administrative task by providing approval. The default, built-in UAC elevation component for an administrator account in Admin Approval Mode is called the consent prompt. The UAC elevation prompting behavior can be configured by using the Local Security Policy snap-in (Secpol.msc) or Group Policy. With UAC enabled, Windows Server 2012 prompts for consent or prompts for credentials of a valid local administrator account before starting a program or task that requires a full administrator access token. This prompt ensures that no malicious software can be silently installed. The consent prompt is presented when a user attempts to perform a task that requires a user's administrative access token. The following is a screen shot of the UAC consent prompt. The credential prompt is presented when a standard user attempts to perform a task that requires a user's administrative access token. This standard user default prompt behavior can be configured by using the Local Security Policy snap-in (Secpol.msc) or Group Policy. Administrators can also be required to provide their credentials by setting the User Account Control: Behavior of the elevation prompt for administrators in Admin Approval Mode policy setting value to Prompt for credentials. The following screen shot is an example of the UAC credential prompt. The UAC elevation prompts are color-coded to be application-specific, enabling for immediate identification of an application's potential security risk. When an application attempts to run with an administrator's full access token, Windows Server 2012 first analyzes the executable file to determine its publisher. Applications are first separated into three categories based on the executable file's publisher: Windows Server 2012, publisher verified (signed), and publisher not verified (unsigned). The following diagram illustrates how Windows Server 2012 determines which color elevation prompt to present to the user. Red background with a red shield icon: The application is blocked by Group Policy or is from a publisher that is blocked. 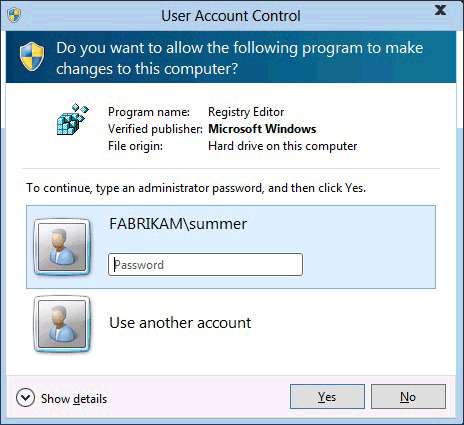 Blue background with a blue and gold shield icon: The application is a Windows Server 2012 administrative application, such as a Control Panel item. The elevation process is further secured by directing the prompt to the secure desktop. The consent and credential prompts are displayed on the secure desktop by default in Windows Server 2012. Only Windows processes can access the secure desktop. For higher levels of security, we recommend keeping the User Account Control: Switch to the secure desktop when prompting for elevation policy setting enabled. While malware could present an imitation of the secure desktop, this issue cannot occur unless a user previously installed the malware on the computer. Because processes requiring an administrator access token cannot silently install when UAC is enabled, the user must explicitly provide consent by clicking Yes or by providing administrator credentials. The specific behavior of the UAC elevation prompt is dependent upon Group Policy. A system service that helps start applications that require one or more elevated privileges or user rights to run, such as local administrative tasks, and applications that require higher integrity levels. The Application Information service helps start such applications by creating a new process for the application with an administrative user's full access token when elevation is required and (depending on Group Policy) consent is given by the user to do so. If the slider is set to Always notify, the system checks whether the secure desktop is enabled. If the policy setting is enabled, the public key infrastructure (PKI) certification path validation is enforced for a given executable file before it is permitted to run. If the policy setting is not enabled (default), the PKI certification path validation is not enforced before a given executable file is permitted to run. The User Account Control: Switch to the secure desktop when prompting for elevation Group Policy setting is checked. If the slider is set to Notify me only when programs try to make changes to my computer (do not dim by desktop), the CreateProcess is called. If the slider is set to Never notify me when, UAC prompt will never notify when a program is trying to install or trying to make any change on the computer. Important: This setting is not recommended. This setting is the same as setting the User Account Control: Behavior of the elevation prompt for administrators in Admin Approval Mode policy setting to Elevate without prompting. 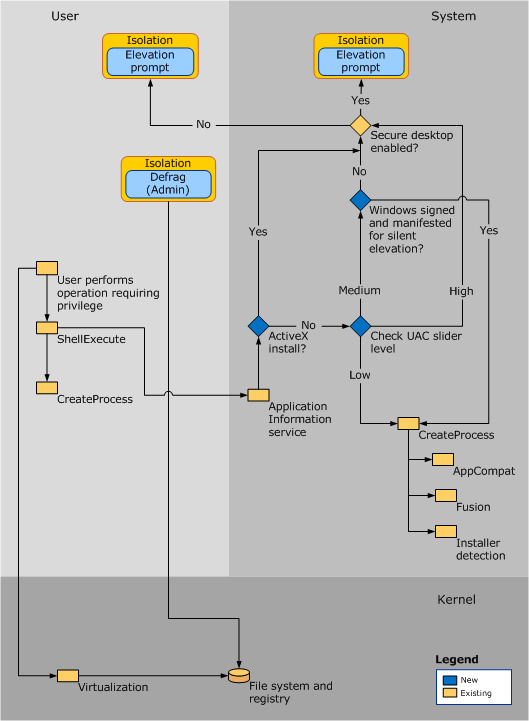 CreateProcess calls AppCompat, Fusion, and Installer detection to assess if the application requires elevation. The executable file is then inspected to determine its requested execution level, which is stored in the application manifest for the executable file. CreateProcess fails if the requested execution level specified in the manifest does not match the access token and returns an error (ERROR_ELEVATION_REQUIRED) to ShellExecute. For more information, see Requested execution levels later in this section. Installer detection detects setup executable files, which helps prevent installations from being run without the user's knowledge and consent. For more information, see Installer detection technology later in this section. Virtualization technology ensures that non-compliant applications do not silently fail to run or fail in a way that the cause cannot be determined. UAC also provides file and registry virtualization and logging for applications that write to protected areas. For more information, see Virtualization later in this section. 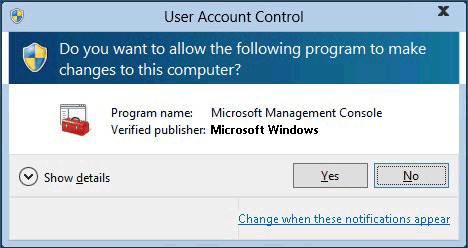 In order to fully disable UAC you must disable the policy User Account Control: Run all administrators in Admin Approval Mode. Tailored Applications will not work on Windows Server 2012 when UAC is disabled. Because system administrators in enterprise environments attempt to secure systems, many line-of-business (LOB) applications are designed to use only a standard user access token. As a result, IT administrators do not need to replace the majority of applications when running Windows Server 2012 with UAC enabled. Windows Server 2012 includes file and registry virtualization technology for applications that are not UAC compliant and that require an administrator's access token to run correctly. Virtualization ensures that even applications that are not UAC compliant are compatible with Windows Server 2012 . When an administrative application that is not UAC compliant attempts to write to a protected directory, such as Program Files, UAC gives the application its own virtualized view of the resource it is attempting to change. The virtualized copy is maintained in the user's profile. This strategy creates a separate copy of the virtualized file for each user that runs the non-compliant application. Most application tasks operate properly by using virtualization features. Although virtualization allows a majority of applications to run, it is a short-term fix and not a long-term solution. Application developers should modify their applications to be compliant with the Windows Server 2012 logo program as soon as possible, rather than relying on file, folder, and registry virtualization. Virtualization supports only 32-bit applications. Non-elevated 64-bit applications simply receive an access denied message when they attempt to acquire a handle (a unique identifier) to a Windows object. 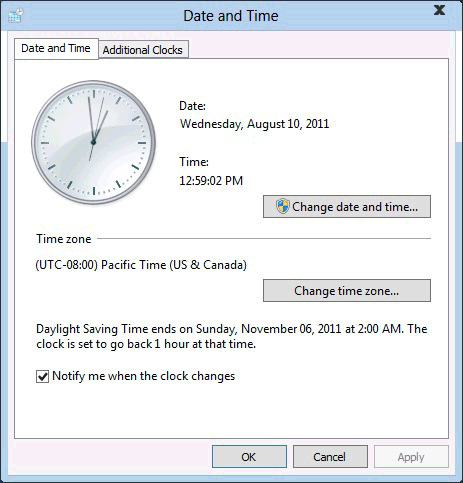 Native Windows 64-bit applications are required to be compatible with UAC and to write data into the correct locations. An application manifest is an XML file that describes and identifies the shared and private side-by-side assemblies that an application should bind to at run time. In Windows Server 2012, the application manifest includes entries for UAC application compatibility purposes. Administrative applications that include an entry in the application manifest prompt the user for permission to access the user's access token. Although they lack an entry in the application manifest, most administrative applications can run without modification by using application compatibility fixes. Application compatibility fixes are database entries that enable applications that are not UAC compliant to work properly with Windows Server 2012. All UAC-compliant applications should have a requested execution level added to the application manifest. If the application requires administrative access to the system, then marking the application with a requested execution level of "require administrator" ensures that the system identifies this program as an administrative application and performs the necessary elevation steps. Requested execution levels specify the privileges required for an application. Installation programs are applications designed to deploy software. Most installation programs write to system directories and registry keys. These protected system locations are typically writeable only by an administrator in Installer detection technology, which means that standard users do not have sufficient access to install programs. Windows Server 2012 heuristically detects installation programs and requests administrator credentials or approval from the administrator user in order to run with access privileges. Windows Server 2012 also heuristically detects updates and programs that uninstall applications. One of the design goals of UAC is to prevent installations from being run without the user's knowledge and consent because installation programs write to protected areas of the file system and registry.